The Fremont Arts Council wants you to join them for a celebration this Sunday, May 1st between 3-10pm for May Day. FAC is taking over the field to play games, dance, sing, and weave the May-pole! You can join the fun at the park entrance near Aurora and 60th, next to the horseshoe courts (see PDF of the park here). Feel free to bring a dish, beverages or tableware to share and bring flowers and natural materials for creating head wreaths. Wearing white is also encouraged. Volunteers are needed, so if you’re interested contact Rodman at rodman (at) rodmanstudio (dot) com. 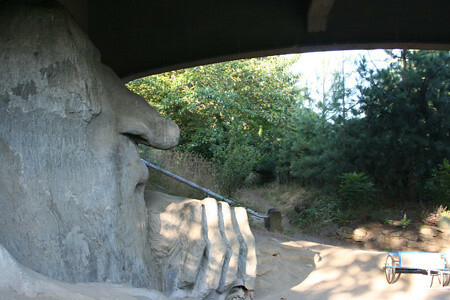 Big changes are coming to the Fremont Troll (much to Knute Berger’s chagrin). Back on December 6th, Seattle Parks and Recreation announced that the plans for Troll’s Knoll was among the possible recipients for their Parks and Green Spaces Levy Opportunity Fund grants. On March 10th, Troll’s Knoll received that funding, which includes $685,000 to turn the land on both sides of the Troll into a new park space featuring a community P-Patch, pathways, wildflowers, new seating and more. The City of Seattle will be implementing the project and they anticipate the planning and design to begin in 2012, with construction in 2013. There will be at least 2 large public meetings to discuss the conceptual and schematic designs which the PAT will be integrally involved with. Stay up to speed on the project by following the Friends of Troll’s Knoll on Facebook. The Royal Wedding is tomorrow, but then again you already knew that. If you’re planning on getting up at 2 a.m. to watch it live, God save you (and the Queen). If not, The George & Dragon Pub will be opening its doors at 10 a.m. on Friday so you can watch the blessed union while also eating a lot of meat. The George & Dragon Pub in Seattle’s Fremont neighborhood will also be showing a tape of the wedding from 10 a.m. to 3 p.m. “Ladies wear your hats, and gents wear your suits” declares the pub’s fliers. In addition to the pub’s usual fare, there will be cucumber sandwiches, sausage rolls and meat pies. Enjoy, though please, please, please, for the sake of any British ex-pats in Fremont, please keep your poorly-accented outbursts of “tally ho!,” “spot of tea,” and “‘allo guvnah” to a minimum. Seattle Met and the experts at Best Companies Group recently used the results of a survey to decide the 20 companies in the area that do the best job fostering “a work-hard, play-hard culture.” One Fremont-based company made the cut. And in case you’re wondering, they’re hiring. The Muse’s Market is a nationally touring, carbon neutral, theatrical concert presenting inspired musicians, educational speakers, spoken word poetry, and fine art in performance arts spaces where listening is the priority. The show is making its stop in Seattle amidst a 5-week West Coast tour this Friday, April 29th at 7:00 p.m. The line-up includes Gabrielle Louise, Panama Soweto, Sebastião Salgado, Jimmy Danko and Laurie Maves. To learn more about the show or purchase tickets, check out their website. You can also purchase tickets at Brown Paper Tickets. Tickets are $12 in advance, $15 at the door. Scary times Monday morning when a fire broke out at the Fremont Ave. Laundromat at 43rd & Fremont Ave N.
The fire broke out sometime after 3 a.m. Monday morning. According to the Seattle Fire Department, there was nobody inside and no one was hurt. The fire apparently started near the rear of the laundromat but all you have to do is look at the front to know it made its way through the entire building. The windows are smokey and one of the front doors was damaged, possibly by firemen entering the building. The cause had not yet been determined as of Monday afternoon. No word on how long the laundromat will be out of commission. You can see a photo of the fire trucks at the scene in the early morning here. Should we get rid of the Fremont Troll? 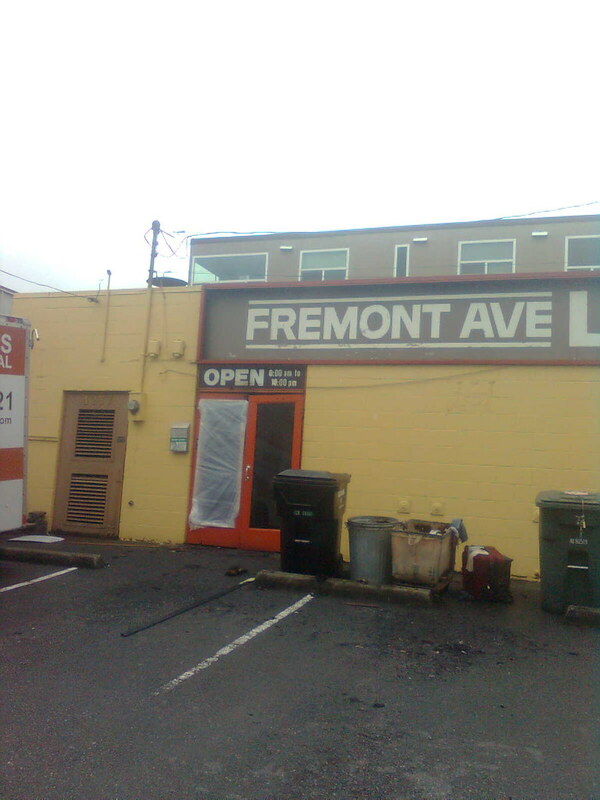 Even suggesting as much within the Fremont neighborhood limits is tantamount to treason. So it’s probably a good thing that Crosscut’s curmudgeon Knute Berger wrote his “Icons we could do without” elsewhere. Fremont is a trove of questionable local icons. The Fremont Troll is ugly and charmless. I say this as someone who grew up on Scandinavian folk stories and learned that trolls are not cuddly forest denizens but creepy serial killers who lie in wait. The Fremont Troll is a bearded Ted Bundy. Of course the Troll is ugly. Trolls are supposed to be ugly. But trolls are fun. I have taken out-of-town visitors there several times, day and night, and there is almost always somebody else there, climbing on it, taking photos of it or just gawking at it. That’s not true of most public art in Seattle, but it is true of the Troll. Kids especially like it. Berger also hates the Lenin Statue (obviously), though he also points out a rebuttal to his own disdain. That’s okay. Most of us love the Troll. Over at Lifehacker, they love the troll enough to use his image in a recent post about internet trolls. Not sure it’s the kind of affiliation the Fremont Troll would want, but, it’s something.